The European Commission’s long-awaited effort to reform Europe’s copyright system includes a proposal for cross-border portability of online content services and an action plan for updating copyright rules. The proposals are the first in its Digital Single Market strategy, the EC said. The announcement prompted mixed reviews from internet service provider and consumer groups and one EU lawmaker but a warmer reception from rights holders. The proposed regulation and action plan (communication) are available here. As a “first step” toward full cross-border access to all types of content, the package published on 9 December proposed a regulation to allow EU residents to access digital content they’ve bought or subscribed to at home while traveling, the EC said. Cross-border portability is expected to become a reality in 2017, the year that sees the end of mobile roaming charges, it said. As a regulation rather than a directive, it will apply to all 28 member states as soon as it is adopted. The EC said it will then consider additional options and legislative proposals for adoption next spring. One will aim to boost cross-border distribution of TV and radio programs online through possible extension of some of the provisions of the Satellite and Cable Directive to broadcasters’ internet transmissions. A second would allow rights owners and distributors to agree on licences that permit cross-border access to content; and a third would make it easier to digitise out-of-commerce collections and make them available across the EU. The proposal also calls for the EC to leverage existing policies to increase promotion of tools to bring more European works into the single market, such as the development of licensing hubs. It will support the creation of a European aggregator of online search tools to help end-users find available legal offers, and “intensify” talks with the audiovisual industry on promoting legal offers and making European films more discoverable. The package also envisions a new look at copyright exceptions and limitations. First, the EC said, it will propose legislation to implement the Marrakesh Treaty to Facilitate Access to Published Works for Persons Who Are Blind, Visually Impaired or Otherwise Print Disabled, which would introduce a mandatory, harmonised EU exception allowing special format of print material for people with print disabilities to be distributed across borders. The EC is also eyeing legislation by spring 2016 to allow public interest research organisations carry out text and data mining of content they have lawful access to for scientific research; clarify the scope of the EU exception for “illustration for teaching” and its application to digital uses and remote learning; and “provide a clear space” for preservation of works by cultural heritage institutions. In addition, the EC said it will support remote consultation in closed electronic networks of works held in research and academic libraries, for research and private study; and clarify the current EU exception that allows the use of works that were made to be permanently located in the public space (the “panorama” exception) to take into account new distribution channels. “The general objective is to increase the level of harmonisation, make relevant exceptions mandatory for Member States to implement and ensure that they function across borders within the EU,” the communication said. On the contentious issue of levies on devices for private copying, the EC said it will decide whether action is needed to ensure that when governments set such fees, their different systems work well within the single market and don’t hamper free movement of goods and services. There is the growing concern about whether current EU copyright rules ensure that the value generated by new forms of online content distribution is shared fairly, particularly when rights holders cannot set licensing terms and negotiate on a fair basis with potential users, the EC said. Talks now centre on certain online platforms and aggregation services but the issues are likely to broaden to all online activities that involve the commercial reuse or retransmission of copyright-protected content, it noted. By spring, the EC plans to decide whether new definitions are needed for the rights of “communication to the public” and “making available,” as well as whether EU-level solutions would increase legal certainty, transparency and balance in the system governing author and performer royalties. Another part of the action plan involves interested parties taking a new, self-regulatory, “follow-the-money” approach to enforcing copyright, the communication said. The EC will also gauge whether the legal framework for enforcement of intellectual property rights should be amended. 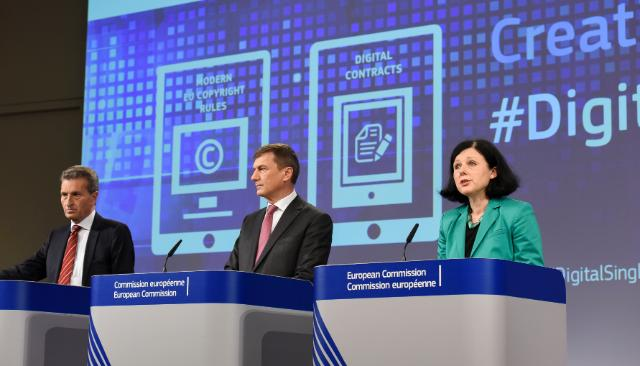 As part of its overall strategy, the EC also floated new rules on the supply of digital content and the online sale of goods across borders (press release here). The Commission promise in its 6 May digital single market strategy to update Europe’s “laggard copyright regime was an eye-catching one,” said EuroISPA representative. But for such reform to be effective, it must include provisions that allow for the emergence of new business models that supply digital content in evermore innovative ways, it said. The copyright communication unfortunately “adopts such a cautious approach the pressing barriers to a modern copyright regime, such as ancillary copyrights, private copy levies, and harmonised exceptions,” it said. The proposed portability regulation “only fixes the cross-border access problems of some of the people under very specific circumstances” – those who have Sky or Netflix subscriptions and wants to enjoy them temporarily while abroad, said German MEP Julia Reda, of the Greens/European Free Alliance Group. It won’t help those who need access to services that are not offered in their home countries in the first place, she said. Reda praised the plan to re-examine the issue of the freedom of panorama exception, but slammed its proposal for an ancillary copyright law for press publishers, which she called a “Google snippet fee.” The other copyright reform plans “remain unambitious” and a “far cry from [European Commission President Jean-Claude Juncker’s] original directions to ‘break down national silos’ in copyright,” Reda added. The European Consumer Organisation (BEUC) welcomed the effort to protect consumers who buy digital goods and want to access their online subscriptions when traveling. But it said the proposal for online purchases of tangible goods “is wide of the mark” because it undercuts essential consumer rights in many countries and fragments the market by differentiating between off- and online shopping rights. Regarding the copyright communication, BEUC Director General Monique Goyens said: “Unfortunately, the new rules will not solve the problem that many Europeans are currently still unable to buy film or video subscriptions from another Member State.” The EC should let consumers buy content available in other European countries in a real digital single market, she said. The Independent Music Companies Association (IMPALA) applauded the EC’s decision to ensure that all services distributing copyright play by the same rules. Executive Chair Helen Smith called for an end to the “so-called ‘value gap’” in which some of the biggest online music distributors are under-licenced or not licenced at all. Independents also want the EU to tackle the “power gap” between online platforms and small actors, she said. "European Commission Unveils First Copyright Reform Proposals To Mixed Review" by Intellectual Property Watch is licensed under a Creative Commons Attribution-NonCommercial-ShareAlike 4.0 International License.